Powers/Abilities: Like Bloodshot, from whom the line is "descended", Rai's nanite blood gives him superhuman speed, agility, and healing powers: total body control. He can also dominate electrical devices and read computers directly through physical contact, which makes him a deadly threat to the robotic Malev invaders. Takeo, the last Rai, is also a Harbinger, able to inspire others to follow him through use of a subconscious psionic ability. History: The origins of Rai lie back in the twentieth century with Bloodshot. During the thirty-first century the nanite technology, the "Blood of Heroes", was infused in the first Rai. Since then for a thousand years thereafter, a successive line of extraordinary men have assumed the mantle of "Rai", the national protector of Japan. Tohru Nakadai was the forty-second nam to become the Japanese national champion. It is "Grandmother", the sentient computer caretaker of Japan, that transformed Tohru into Rai, imbuing him with vast and powerful energies. During Tohru's tenure as Rai, the Spider Aliens invaded Earth for the second time. Controlled by Grandmother, the enormous robot-body that covered the Japanese islands was brought to bear against the alien starships. The alien armada was destroyed, but Japan would never be the same. Grandmother relinquished control of the nation of Japan, which now orbited Earth like a second moon....and, during the battle, Tohru's wife, Kayuzo, acquired an alien battle-armor suit (see X-O Manowar), making her nearly as powerful as Rai! Later, during the Unity conflict, Mothergod caused Japan to fall from orbit, effectively destroying the once-proud country. Tohru attempted to avenge his slain countrymen, but was himself killed by the murderous Mothergod. Later, with Earth under attack by the evil Malev robots, Geomancer Rokland Tate infused Takao Konishi with the fabled "Blood of Heroes", dubbing Takao as the "Last Rai". 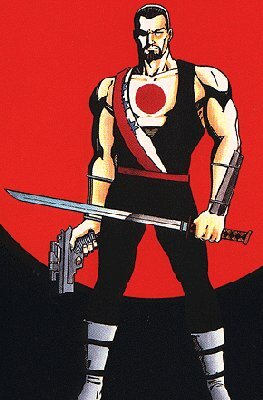 Now Takao wields the powers of the nanite-laced blood that once coursed through Bloodshot's veins. With the cry of "Mindlock! ", he can mentally control the Malev invaders, one at a time. And Takao has a further talent. He has the Harbinger ability to psionically inspire others. The stronger his own convictions are, the more others will be inspired to follow him. Fighting alongside this new Rai are Magnus, Tekla, the Eternal Warrior, Kayuzo in her X-O Commando armor, and the mysterious Spylocke.